Nikonians Academy Director Mike Hagen sends this week's update from Iceland, where he is leading a group of photographers through Iceland's landscapes and bird sanctuaries. His group is now photographing geothermal sites, glacial lagoons, birds, landscapes, volcanoes, lava fields, waterfalls, and basalt columns. Mike also included a photo tour of Reykjavík that includes buildings and architecture. 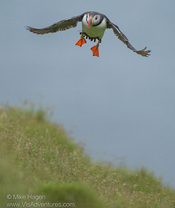 "Puffins in flight are some of the most difficult birds to photograph. I'm working closely with our photography group and so far, everyone has taken keepers of this beautiful maritime bird." Mike's image (at left) was taken this week with his Nikon D800 and AF-S NIKKOR 200-400mm f/4G ED VR II Lens. He shot at 1/2000 sec, with an f/5.6 aperture and ISO of 1600. Next year's Iceland trip will run July 16-24, 2017 and Mike will have it posted to the Nikonians Academy website immediately upon returning to his office. 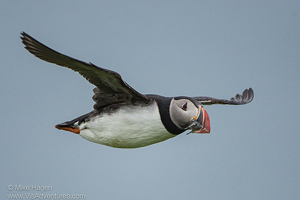 To learn how to master Nikon's autofocus system to capture bird-in-flight shots like the ones shown here, check out Mike's CreativeLive workshop titled The Nikon Autofocus System. Here's the direct link. Mike will help you configure the autofocus system for portraits, sports, wildlife, and landscapes. Relying on autofocus will let you concentrate on lighting and composition, and help you take advantage of those fleeting moments. 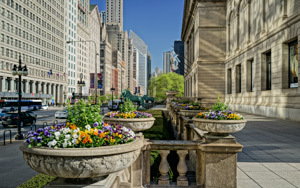 Rick Hulbert's Urban and Street photography workshop concentrates on the other end of the photography spectrum. Rick's next stop will be Chicago in September. He takes participants through an amazing instructional process to help them see and understand urban landscapes. His specialty is teaching attendees how to capture people in the built environment. You're going to love this class. If you are returning participant to Rick's Urban and Street Photography Workshop, Rick would like to offer you a special 25% off deal. We'll send refund details after you sign up. Nikonians Contest Coordinator David Summers (dm1dave) has posted the results of the May 2016 competitions. Congratulations to our winners! 1. Wildlife - "No Fur, No Feathers" theme winner Mark Kraus (pipco), from Ohio, USA with his image titled Working Under-cover. 2. Landscape - "It's all about the clouds" theme winner Keith Manning (kamf0t0) from New York, USA with his image titled Burning Clouds. 3. Macro - Sharp" theme winner Godofredo Baylon (GBaylon), from Ontario, Canada with his image titled You won't feel a thing...trust me. 4. Travel - "Interesting Lights" theme winner Jeff Atchley (Graceland) from Tennessee, USA with his image titled The shadow fountain. 6. May Assignment - "High Contrast" theme winner Olivier Rychner (olivierrychner) from Switzerland with his image titled Room in a castle. 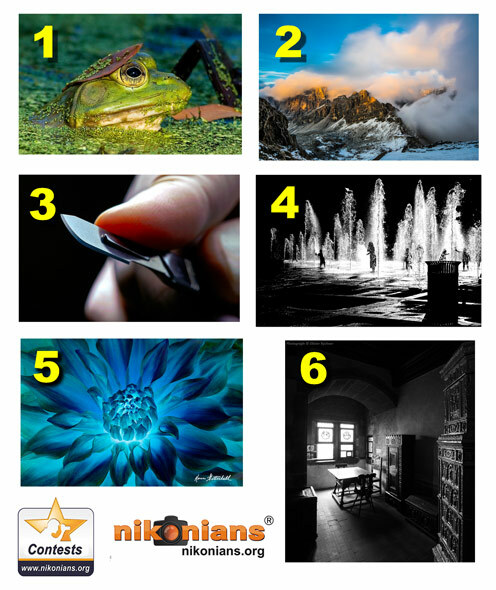 The Nikonians online assignment is a great opportunity to have some fun and learn at the same time. The monthly Assignment is a bit different from our other contests. We present a new assignment each month and the images posted are to be shot during that month with specifically to fulfill the assignment. This is one of Nikonians best learning resources. It teaches beginners how to preconceive an image and follow through to a completed work, to building both technical and compositional skills. Advanced photographers will grow their abilities by working outside of their usual photographic style. The July Assignment is "Isolation." - a wall worthy image that demonstrates the photographic technique of isolation - i.e. making your subject stand out as the main focal point of the image.